BladeSymphony blade servers inherit its core design from our line of highly reliable mainframe platforms bound together by a robust management software solution. BladeSymphony management solutions simplify the administration and management of BladeSymphony servers in enterprise datacenters. BladeSymphony 1000 blade systems also supports Multi-Blade Symmetric Multi Processing (SMP) interconnect technology for scalable performance. Transaction recovery is supported with our N+M standby feature improving system reliability and availability. High performance and high availability features allow BladeSymphony to be utilized in small departmental office environments to large back-end enterprise datacenters. 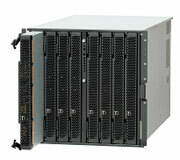 The BladeSymphony 2000 blade server is a 10U-high server chassis supporting up to 8 server blades. 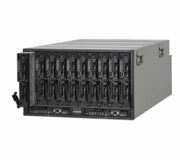 The BladeSymphony 320 blade server is a 6U-high server chassis supporting up to10 server blades achieving one of the industry’s highest level of server density and space-savings. © Hitachi, Ltd. 1994, 2012. All rights reserved.